The starting and finishing points are located in the La Floresta neighbourhood; a 10-minute walk from Plaza Mariscal Foch or a 10-minute ride from the Old Town (via bus or taxi). Quito is located at 2860 metres above sea level. Please acclimatise for at least 24 hours before you ride with us! Have a light breakfast or lunch as this will help reduce nausea and altitude sickness. A good attitude, a sense of humor, a spirit of adventure, sunscreen, water, rain-jacket, some cash and your digital booking ticket/ confirmation. We start and finish in two different points. See below. The Starting point for each tour is located next to the Ochoymedio Cinema in La Floresta. The street address is Valladolid Street, near the corner of Vizcaya Street. Do you offer hotel pick up and drop offs? Do I need to acclimatise before riding? How hard are the tours and how fit do I need to be? Our tours are easy to medium and we go at a leisurely pace. The rides are designed with lots of stops to share information, food, drinks and good times. If you can ride a bike you can do our tours! They are not designed for Tour de France experts, but don’t lose sight of the fact that you will be cycling on the earth’s highest capital, at approximately 2867 metres above sea level. Take your camera, phone to capture the journey. You will have an opportunity to take cool photos and meet some locals. When taking pictures of people; please ask before. They also love selfies. Please do not hold your camera or phone whilst cycling as you can have an accident, get your camera damaged or stolen. We also will love you if you share your images on social media, Tripadvisor and other channels. What do I need to bring to the tour? Do I need to bring my booking confirmation? Yes, either printed or digital is fine. Water. Say what? Water! No, we aren’t being tight. As a company who values sustainability and not plastic, we ask that each participant to bring their own bottle (hopefully reusable). We promise that we will make it up to you in other ways! We accept the following credit cards: Visa, MasterCard, Maestro, Amex, and Diners. We also accept Cash. By visiting our store and paying directly. 100% refund if you cancel at least 48 hours before the starting time of your tour. NO REFUND for cancellations less than 48 hours before start of tour. NOTE: All refunds will incur a 5% processing fee of the total amount of your tour. Can I cancel or get a refund if it rains? Quito often experiences the four seasons in one day. Regardless of how brightly the sun is shining, you should always bring a rain jacket! You really need to trust us on this! Having said that, in the case of rain, the ride will go on! We will, however, cancel the tour in the event of extreme weather or where we feel your safety will be compromised. In this case, you can either obtain a full refund or reschedule. BUT if it’s raining an hour before the tour, and you just don’t want to cycle and prefer to cancel, let us know. We will offer you a full refund or reschedule. Each tour begins at the Ochoymedio Cinema in the La Floresta neighbourhood, Quito. Each tours finishes at La Cleta Bici Café in the La Floresta neighbourhood, Quito. The minimum number of people in a group tour is 3 and the maximum is 7. When we have 4 people or more we will also have a volunteer helping us, by trailing behind the group. Do you run a tours with only one or two people? Yes we do, but this is considered a private tour. Please check the desired Tour for private options and pricing. The sooner the better! Reservations are always recommended. Online reservations remain open until 4pm on the day before your chosen tour date. You can also visit our office and, depending upon availability, book the tour directly. What if I want to do more than one tour? If you join us on a second tour we’ll give you $10.00 off. Please let us know before booking your first tour, so we can give you a discount code for the second. Quito often experiences the four seasons in one day. Regardless of how brightly the sun is shining, you should always bring a rain jacket! You really need to trust us on this! Having said that, in the case of rain, the ride will go on! We will, however, cancel the tour in the event of extreme weather or where we feel your safety will be compromised. 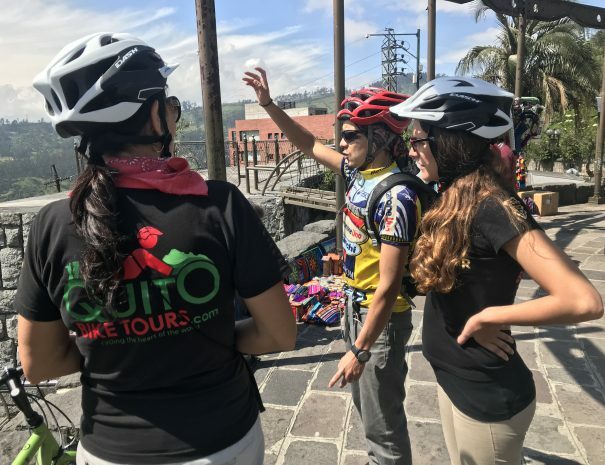 At Quito Bike Tours, your safety comes first. Always! What are the riding conditions? Approximately 90% of the rides/tours are on bike paths. What language will the tour be guided in? Our regular tours are in English and depending on the numbers also in Spanish. Private tours are offered in both languages. For our regular tours we only allow passengers age 13 years or older. The minimum height requirement is 145 cms. Do you have children's bikes? At the moment, no. As mentioned above, you must be at least 13 years of age to participate in our tours. Group tours have a minimum of 3 and a maximum of 7 people. Private tours are for 1 or 2 people who have specifically arranged this (at a different price). A private tour can also be a family tour or one that you wish us to tailor specifically to you and/or your group. Once tour is confirmed you will receive the payment receipt and ticket with instructions. Read more details on our bike rental page. 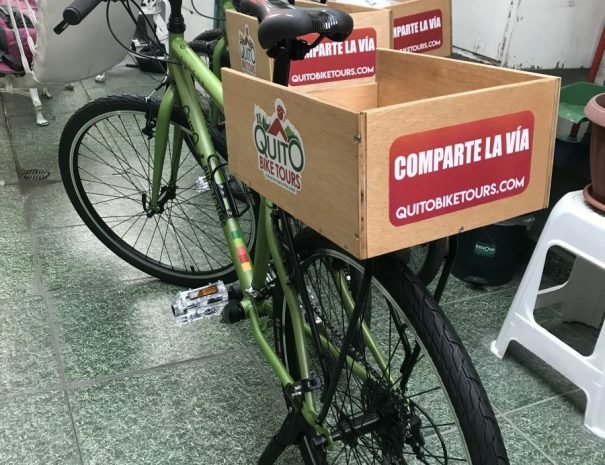 Is it safe to cycle in Quito? By taking all the right precautions, Quito is a really fun place to cycle. We take designated bicycle paths where possible, as well as backstreets, but as you can understand, it’s not always possible to avoid traffic. At Quito Bike Tours we take safety super seriously. Really! We provide helmets and safety vests on every tour, and lights as well on night tours. All of our guides have a full professional guiding license as well as an up-to-date First Aid Certificate. Have fun, but please always follow your guide’s instructions. Am I insured on the tour? No, you are not. 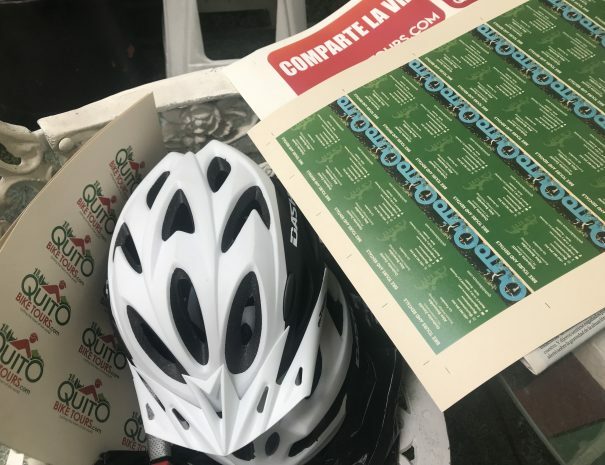 You need to have your own insurance and under no circumstances will Quito Bike Tours be held responsible for any accident that may occur on the tour. If you choose to partake in the tour without travel insurance, you do so at your own risk. The tour was great! How do I let you and everybody else know about it? We would love for you to share you experience with us via Tripadvisor, Facebook, Instagram or any type of social media networks. Word of mouth is also awesome. You can also write to us personally. Please send your testimonial and pictures to info@quitobiketours.com. We like to put these up on our website. C’mon, share the love! Can I bring my own bike to the tour? The bike is included. If you do wish to use your own bike, however, the price remains the same. You will also be held responsible and have to pay for any mishaps along the way (basically, we will not be held responsible for your bike). Yes! 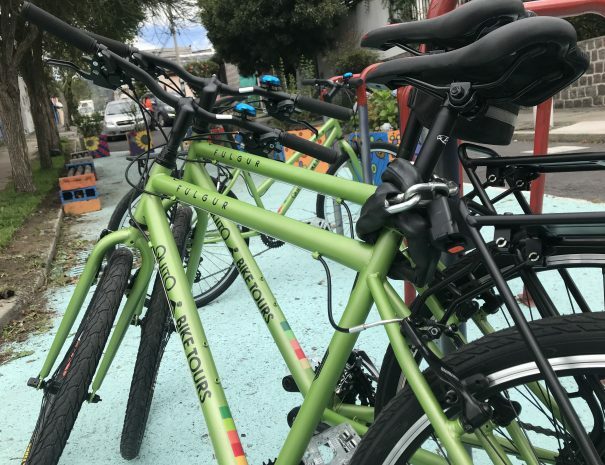 Safety always comes first at Quito Bike Tours.